Iran has claimed that it has launched a 50-year-old destroyer on the Persian Gulf after repairing it and rearming with modern missiles. Iran has claimed that it has launched a 50-year-old destroyer on the Persian Gulf after repairing it and rearming with modern missiles, Fox News reported. Iran, pursuing a self-sufficiency military program, has maintained that it is producing its own jet fighters, tanks, missiles and light submarines as well as torpedoes. Experts had equipped the destroyer Bayandor with anti-ship missiles capable of firing 100 miles during its 20-month overhauled, an Iranian official said according to Iran’s state television. 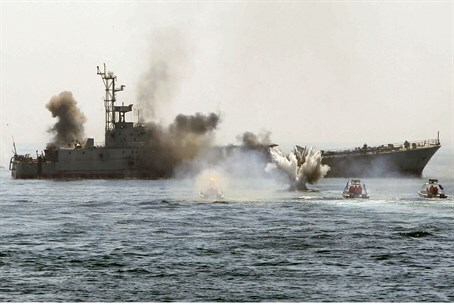 The officials said the destroyer joined Iran's navy in 1964 and is named after a World War II war hero. Minister of Strategic Affairs, Intelligence and International Relations Yuval Steinitz said on Monday that Iran is getting closer to reaching the “red line” of nuclear capability set out by Prime Minister Binyamin Netanyahu. Speaking to reporters in Jerusalem, Steinitz said Iran is working round the clock to enlarge its nuclear infrastructure with the eventual aim of developing an industry capable of building up to 30 bombs a year. "The Iranians are getting very close now to the red line... They have close to 200 kilos -- 190 kilos (418 pounds) -- of 20 percent enriched uranium," Steinitz said, according to the AFP news agency. "It is a matter of weeks or maybe two months to jump from 20 percent to 90 percent with so many centrifuges," said Steinitz. "What they are doing now -- instead of crossing the red line, they are widening and enlarging their capacity by putting in more centrifuges, faster centrifuges," he said.